Here’s what to do: Grease a tin and layer 3 strips of filo with oil between each layer. 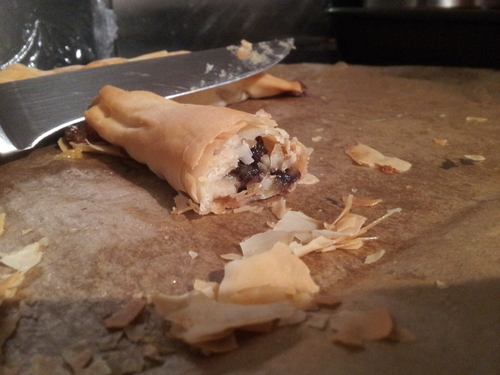 Next put one strip of marzipan down the middle of the pastry, then layer a handful of raisins and some lightly microwaved apple, stewed with a little water and mixed spice or cinnamon. Roll into parcels/sausages and cook for about 20 mins at 160C.